"...Lord and Miller have established another limitless playground for their brand of joke-slinging." "Even as this Lego universe is expanded, it begins to reveal its similarities to a universe that already exists." The Lego Movie presented itself as an adventure taking place in a world where everything was made of Legos, but there was a twist. These were actually the Legos of one particular child, only he happened to be an adult child who didn’t want his children to mess up his immaculately constructed Lego architecture. A style shift from animation to live action at the very end, in which President Business turned out to be an actual man played by Will Ferrell, was an unexpected and thematically rich way to do what writer-directors Phil Lord and Christopher Miller do best: go outside the box and examine the conventions of entertainment from a meta level. In The Lego Movie 2: The Second Part, Lord and Miller have relinquished the director’s chair to Mike Mitchell. But they remain as writers and producers, which is probably key to why this makes for a sequel about 90% as good as the original. No longer constrained by trying to keep their twist a surprise, they can more fully incorporate the real-world themes of family relations throughout the script. This time, it’s not about a controlling dad. Ferrell presumably wasn’t available for the shoot and has only a few lines shouted awkwardly from other rooms, as a humorous way to draw attention to his lack of availability. The focus instead is on sibling rivalry, on how the son from the original film needs to protect his own Lego creations from invaders who want to do them some very cute and some very pink damage. That’s his younger sister, who builds with the larger Duplo bricks and wants Batman to get married rather than catch criminals. This conflict is still mostly played out at the Lego level, by characters returning from the original film. Only now Emmet (voice of Chris Pratt) and Wyldstyle (voice of Elizabeth Banks) preside over a wasteland known as Apocalypseburg, the ruins of Bricksburg, where everything was once awesome. To them, this was the result of a war with alien invaders, who repeatedly smashed every building they tried to build. To us, it looks less like a pile of stomped-on bricks and more like a lovingly crafted post-apocalyptic landscape, with a Statue of Liberty bust jutting out sideways from the wreckage, and vehicles and warriors that recall Mad Max: Fury Road. Which is a heck of a fun place for a Lego movie to go. It doesn’t stay there. 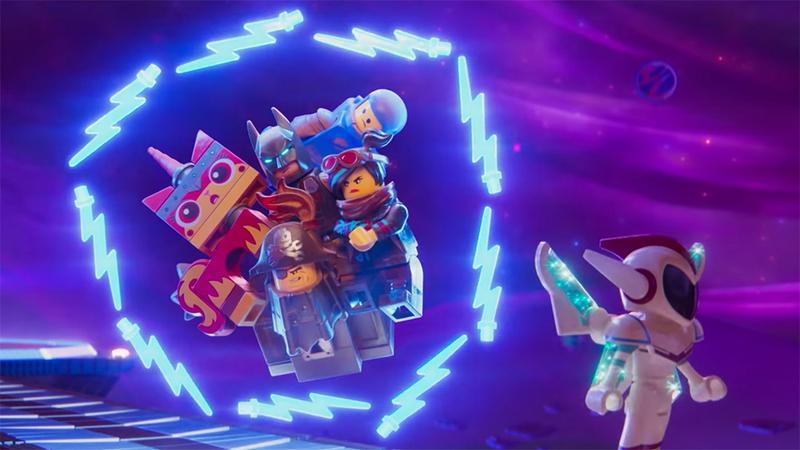 Emmett’s destination is actually outer space, as the invaders come and capture Wyldstyle, Batman (voice of Will Arnett) and a number of others to take them away to their home planet. Emmett was powerless to stop it, a failure he attributes to Wyldstyle’s frequent complaint that he has not matured past that loveable, optimistic dimwit we saw in the first movie. So he builds a space ship to follow them, and on his way encounters Rex Dangervest (also Pratt), a space cowboy who wrangles raptors. (Thereby combining elements of Pratt’s roles in Guardians of the Galaxy and Jurassic World.) Rex and Emmett plot a course for the Syster System, ruled by Queen Watevra Wa’Nabi (voice of Tiffany Haddish), a shape-shifter who has nefarious plans to marry Batman. This is all terrific grist for this mill, as Lord and Miller have established another limitless playground for their brand of joke-slinging. The joke-a-second pace they established in the first film continues unabated, meaning that a decent percentage of the jokes don’t actually have to hit as long as the others do. And some of them don’t. The humour related to the physical characteristics and limitations of the plastic bricks themselves is still going strong, but this is the third Lego cinematic property to try to mine comic gold from the rivalry between Batman and Superman, if you include The Lego Batman Movie. As Batman has only been the main character in one of those movies, it’s probably time to give this a rest. So as not to feed the trolls, it’s probably not worth going on at length about how the film endorses the current trend of deconstructing who is allowed to save whom, or how it reserves its greatest scepticism for the characters who represent old-school gender politics. It does these things with a certain generosity of spirit toward those characters, in any case. So the trolls can save their ire for Captain Marvel. Even as this Lego universe is expanded, it begins to reveal its similarities to a universe that already exists. 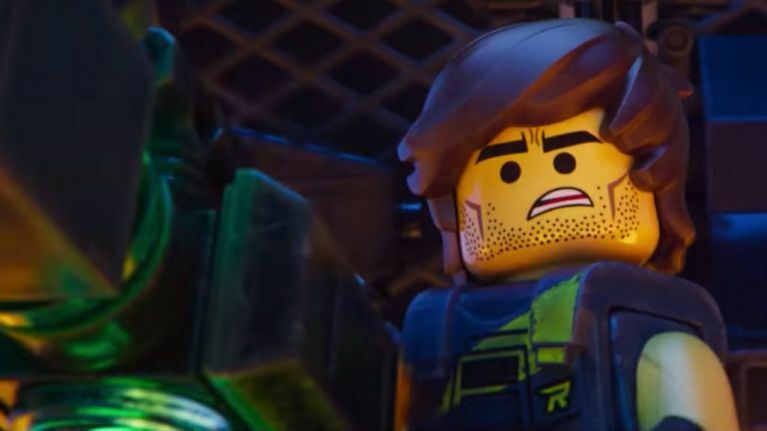 The foregrounding of the twist about the real family playing with real Legos tends to underscore how much the Lego movies have in common with the Toy Story franchise, which will receive its own fourth instalment later this year. The differences are enough to keep the two properties from cannibalising each other, but it’s worth wondering if either can be stretched much further before wearing out its welcome. Everyone thought Toy Story was done after three movies, but the desire to sell more toys (and a great script, or so they say) pushed Pixar past the built-in endpoint of a trilogy. 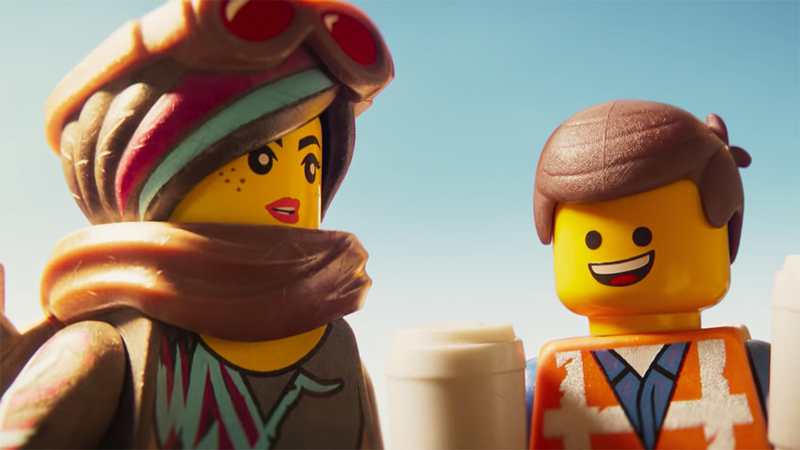 We may not need four Lego movies, but The Lego Movie 2 convinces us that a third has been more than earned.